When Kat Tamulionis arrived on the Merrimack College campus for her freshman year, she was confident that she was ready for the challenge of transitioning to college life and to college basketball, but she struggled to find the right fit between her commitments in the classroom and on the court. Making the transition from high school to college is never easy, trying to find the right fit for classes, dorms, friends, a new campus, let alone the pressure of new teammates, new coaches, and a new practice schedule. It can be overwhelming. After spending preseason with the team, Tamulionis decided to step away from the team. The following fall, she took a semester off to figure out what she wanted to do next. In December of that year, she made the decision to transfer to Babson College and she decided to get back on the court, joining the Beavers and making her collegiate debut Emory and Henry College (Va.). The switch has worked out pretty well. Tamulionis played in 21 games her first season at Babson and last season (which was technically her sophomore year because of the credits that transferred over from Merrimack) she started 22-of-27 games and averaged more than eight points per game, including a career-high 19 against Emerson College in the NEWMAC quarterfinal. Tamulionis has started all of Babson’s first six games (4-2) and is second on the team with 11.2 points per game, shooting 44 percent from the field for the Beavers, who are riding a two-game win streak. Besides moving during the winter break, several factors were in her favor when making the decision to move to Babson. There was a familiarity with the coaches because they had recruited Tamulionis two years before when the HockomockSports.com Player of the Year and Hockomock League MVP was leading Foxboro to its first league title in more than a decade, while averaging 16 points per game. There was also a familiar face that Tamulionis could lean on for advice. 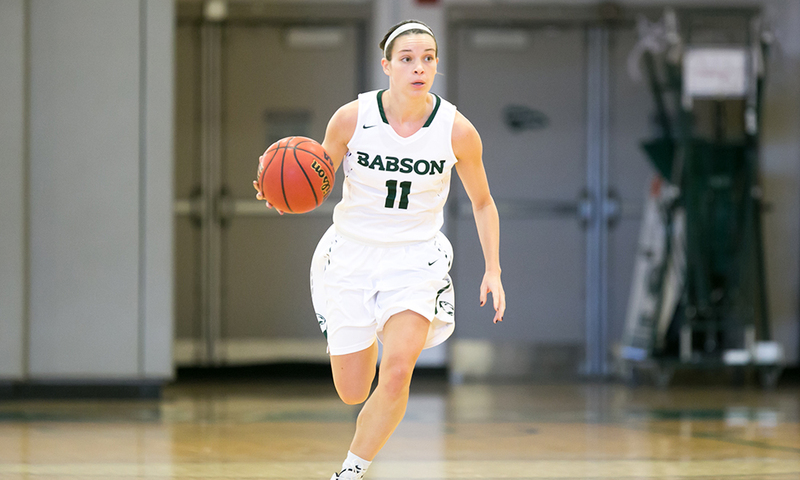 Former Foxboro standout Ashley Snyder was a member of the Babson team that season, after transferring to Babson from UMass Lowell. Snyder offered Tamulionis the inside info about the team, but also understood what it was like to move between schools. The Tamulionis sisters played together at Foxboro when Kat was a senior and Grace was just a freshman. That rookie class, which also included Lily Sykes, Ashley Sampson, and Shannon Smally, was a big factor in the Warriors making a run to the Div. 2 South final during Kat’s senior year. Experience is also something that Babson is counting on this winter. The Beaver come into the year with eight juniors or seniors on the roster. Many of the players have been together for two or three seasons and that chemistry has the team confident of challenging for the NEWMAC title and getting back to the NCAA Tournament. As the team looks forward to the rest of a busy season, Tamulionis was able to reflect on how she got to Babson and how different things are not that she is there.